Dulwich College Suzhou opened in 2007 and is recognised as a leading international school in the city, just 30 minutes from Shanghai. Our college is a co-educational day school for students from age 2 to 18 and also offers full time and flexible boarding for students over eight years old. Dulwich College Suzhou is academically selective and follows an enhanced British curriculum adapted for the needs of our international student body. Our academic curriculum is complemented by rich co-curricular programmes. Students in Years 10 and 11 follow the IGSCE curriculum and the IB Diploma Programme in Years 12 and 13. Our graduates go on to study at leading universities in the UK, USA and around the world. The primary teaching language is English, with a dual language approach in Mandarin and English in the early years (ages 2 to 7). To ensure our students will thrive, we assess the level of English of non-native speakers before an admissions decision is made. Our Mandarin programme is streamed and caters to all abilities. The close collaboration among our Colleges and with the founding school, Dulwich College, gives our students unique opportunities to participate in network events and benefit from the group's relationships with leading educational and artistic organisations. We encourage you to visit our campus to learn more about the College and meet our diverse community. If you are unable to visit at this time, please explore our website, contact our admissions teams with any questions you may have or call +86 (512) 6295 7794. To apply please review the admissions criteria below and complete the online application form. We accept applications throughout the year and as an international school, our College is permitted to enrol students with an overseas passport or overseas birth certificate. Please enquire with our admissions team if you are unsure about eligibility. In addition to the providing the application form and supporting documents, all students wishing to enrol are subject to the application criteria below. To determine which year to apply for, please refer to our age placement guide below. As a general rule, students should have reached the age indicated in the table before 1st September of the year of application. Children entering Early Learning 2 should be toilet trained, and those entering Early Learning 3 must be toilet trained. All applications to Early Learning 2 and 3 are reviewed by the Head of DUCKS. Children applying to Year 1 or Year 2 will only be admitted to the College once the Head of DUCKS or his designee has met with one or both of the child’s parents. All previous school reports, observations and assessments should also be made available to the College at this time. Where possible it is strongly recommended that the child spend a morning or day in either Early Learning 3 or Year 1 in advance of admission so that the College can gauge the child’s level of readiness. Applicants who cannot be assessed in person will be admitted on a provisional basis at the discretion of the Head of DUCKS. Students applying for admission to the Junior School undertake assessments to ensure they can access the curriculum. Students are required to take the Cognitive Abilities Test (CAT) consisting of verbal, quantitative and non-verbal assessments. The Admissions officer will arrange a time for the student to sit the assessments and communicate this to parents. This assessment can be done at the student’s current school under the supervision of a teacher. Students entering the Senior School are required to take the Cognitive Abilities Test (CAT) consisting of verbal, quantitative and non-verbal assessments. Applicants will be interviewed by the Head of Senior School. All students will be asked to complete a written English test as an additional language assessment, which is reviewed by the Head of Senior School EAL (English as an Additional Language). Students entering the Senior School are required to take the Cognitive Abilities Test (CAT), consisting of verbal, quantitative and non-verbal assessments. Applicants will be interviewed by the Head of Senior School. All students will also be asked to complete a written English test as an additional language assessment reviewed by the Head of Senior School EAL (English as a Additional Language). Candidates applying for a place in Year 12 or 13 will be interviewed by the Head of IB or Senior Studies, who will make a recommendation to the Head of Senior School. Special arrangements can be made for the assessments to be administered in an applicant’s current school. Just contact our Admissions team. At Dulwich College Suzhou, we appreciate the cultural diversity that non-native English speakers bring to our school and we are able to support a percentage of students who are non-native English speakers. Applicants who speak languages other than English should be able to demonstrate age-appropriate academic proficiency in their native tongue. Our admissions team may request that students be assessed on their ability to handle the academic challenges of English before an admissions decision is made. 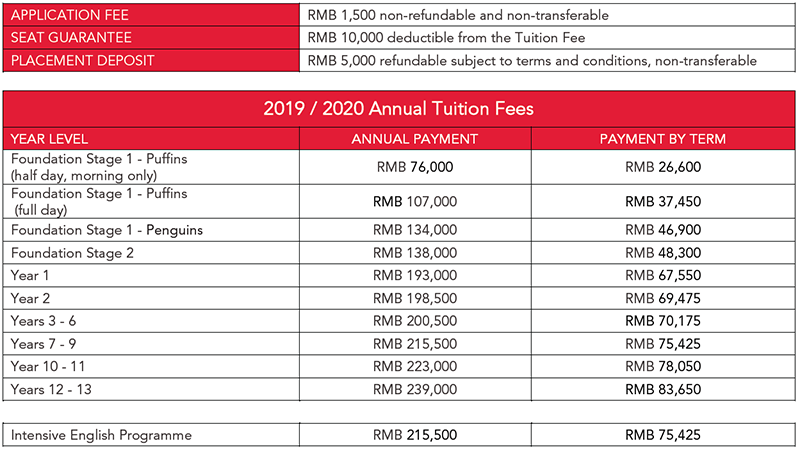 Our tuition fees for the 2019/2020 academic year. Examination fees for IGCSE and IB programmes are included in our tuition fees. Fees do not cover personal expenditures for things such as uniform, any educational visits (day trips or residentials), private tutoring, private music lessons, school supplies, sports equipment, clothing, personal items, taxis, personal travel in school vehicles or medical expenses. A detailed statement of account is issued each month. The Boarding Feeincludes breakfast, evening and weekend meals and most activities. Boarding Contingency Fund: A deposit of RMB 5,000 must be paid on enrolment to meet emergency expenses such as medical bills. Contingency charges will be adjusted against expenses incurred by the student and should be topped up each term. The surplus, if any, will be carried over to the next term’s account or returned when the student leaves. The school bus service is also paid in addition to the tuition fee. One-way bus riders are charged the same as round trip bus riders. Bus refunds for students who need to change their bus arrangements during the school year will be handled individually. Fees for the school bus service for Academic Year 2019-2020 are still to be determined. The current years bus fees are shown below. The School can arrange transport to and from Pudong and Hongqiao Airports and the Suzhou and SIP train stations. The cost can be deducted from the Boarding Contingency Fund. Please note that the driver may not speak English. The cost of school lunch is not included in the tuition fee for students (including boarders). School lunch is catered by Sodexo and works on a Smartcard system. Lunch fees can be paid annually, by term or by month directly to Sodexo. Tuition and Boarding fees may be paid annually or by term. Fees paid annually enjoy favourable rates compared to fees paid by term. Each term’s fees and all other amounts for which the parent/guardian is liable must be paid before the beginning of the College term. Whether fees are paid by the parent/guardian or a parent/guardian’s employer, the parent/guardian shall take full responsibility to ensure that fees are paid in full before their child may begin classes or board at the College. Families with three or more children enrolled in full day programmes are entitled to a discount of 5% per student with the exception of children in our EL1 year group. RMB cash. We regret that the College is not able to accept U.S. Dollar cash payments. Wire Transfers in RMB or U.S. Dollars. Bank account details are printed on all invoices and are available from the Finance Department. When paying by wire transfer in U.S. Dollars, please use the prevailing People’s Bank of China approved RMB/USD exchange rate at the time of payment. Any shortfall in amounts received by the school for any reason will be due on demand or carried forward to the next invoice at the College’s discretion. Please read the College’s Terms and Conditions below for more information. Below are a number of questions that families often ask members of our admissions team. Do you have a waiting list? If so, how are admissions prioritised? If an applicant does not obtain a place during the term for which he or she has applied, the applicant will be automatically transferred to the waiting list for the following term. At the end of the academic year an applicant’s name will be transferred to the appropriate year level for the new academic year. Waiting list positions are not disclosed to parents. Waiting lists are common for entry into most year levels. We always advise early application. What admissions testing do you do? I do not plan to visit Suzhou before we move. Where can my child be tested? All applications to Early Learning 2 and 3 (Nursery and Reception) are reviewed by the Head of DUCKS before the child is offered a place. Students applying for Years 1 or 2 will only be admitted to the College once the Head of DUCKS or her designee has met with one or both of the child’s parents. Any previous school reports, observations and assessments should be made available to the College at this time. Where possible it is strongly recommended that the child spend a morning or day in either Early Learning 3 or Year 1 in advance of admission so that the College can gauge the child’s level of readiness. Applicants who cannot be assessed in person will be admitted on a provisional basis at the discretion of the Head of DUCKS. Students applying for Junior School (Years 3 to 6) undertake assessments to ensure they can access the curriculum. Students are required to take the Cognitive Abilities Test (CAT), consisting of verbal, quantitative and non-verbal assessments. The Admissions Officer will arrange a time for the student to sit the assessments and communicate this to parents. You should allow at least half a day for your child to complete these assessment tests. Students applying for Years 7 to 11 in Senior School are required to take the Cognitive Abilities Test (CAT), consisting of verbal, quantitative and non-verbal assessments. Applicants will be interviewed by the Head of Senior School. All students will sit an English as an additional language assessment. The Head of IB or Senior Studies will interview all candidates applying for a place in Year 12 or 13 and make a recommendation to the Head of Senior School. Special arrangements can be made for overseas candidates for the assessments to be administered in an applicant’s current school. Contact our admissions team to make the arrangements. We will usually be able to tell you within a few days whether we will make the offer of a place. We do not release the results of the assessment tests. Students are permitted to re-sit the assessment tests after 6 months have passed. The College reserves the right to increase the maximum number of students in each class under special circumstances with approval from the Head of College. Yes. DUCKS, Junior School and Senior School each have their own restaurant facilities. How much do lunches cost per day? No. We are a nut free school. Your child may bring their own packed lunch to school if you prefer but please remember that it must be nut free. We serve a wide variety of healthy dishes with a mix of Western and Asian choices. All students except Toddlers and IB students at Dulwich College Suzhou are required to wear the school uniform. The school uniform is different for warm and cold weather, and students should adhere to seasonal requirements. Please be sure that all items are clearly marked with the student’s name. School uniform can be purchased from the uniform shop located on the first ground floor of the Junior School campus. The following is a guide to the amount of homework your child can expect to get each week. This does not include reading time. Students are expected to be in school for registration at 8.10am and school finishes at 3.30pm. Yes, school bus service is available with pick-up locations across Suzhou. What if my child stays at school late for activities? Can he or she still get a bus home? If you have paid for school bus transportation for your child, a late bus service is provided when they have after-school activities. Please refer to the School Bus Fees table in the Fees section of this page. The cost of bussing is not included in the tuition.